2012/05/17 - Rebellion the new T-1000 Time Machine "Goldorak" Limited by 5 Pieces! With a mind-blowing power reserve of more than 1,000 hours, the racing-inspired T-1000 Time Machine doesn't just push back the boundaries of the possible – it blows them away to create a totally new reality. 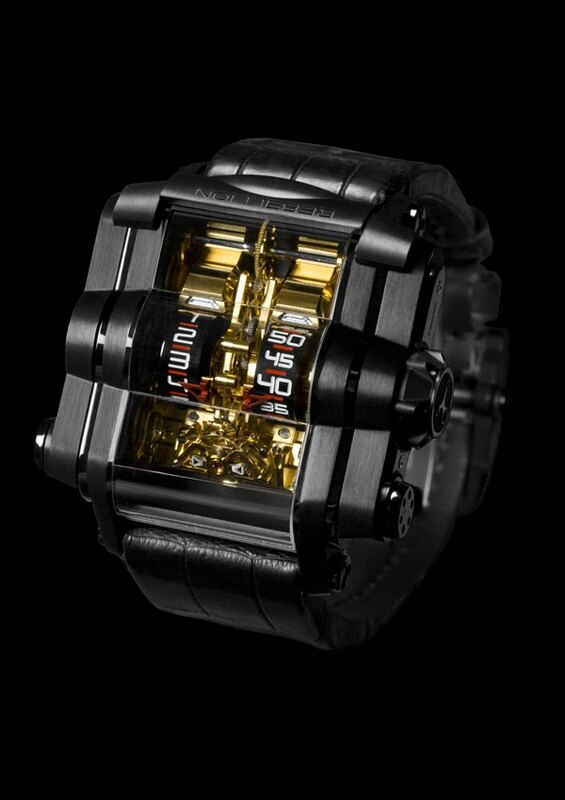 An amazing six – yes, SIX – mainspring barrels provide the T-1000 with a colossal energy reserve – power generated by an ingenious, over-sized winding lever cleverly housed in the stylish case of what is a stunningly innovative timepiece. Although the T-1000 is the first watch ever to last longer than 40 days and 40 nights without rewinding, it took Rebellion a mere 24 hours to come up with the concept. But what a 24 hours it was. Although the contest had ended, it was in this atmosphere rich with the smell of motor oil and hot engines that something very special had begun – a challenge had been set. McQueen’s character in Le Mans, Michael Delaney, utters the immortal line: “A lot of people go through life doing things badly. Racing’s important to men who do it well. When you’re racing, it’s life. Anything that happens before or after is just waiting.” Embracing this spirit and applying it to the art of watchmaking has enabled Rebellion to create their own majestic endurance machine: The T-1000. Six mainspring barrels provide the T-1000 with its exceptional 1,000-hour power reserve. In a patented system of energy distribution, the six barrels are wound in parallel by two finely-engineered chains, discharging in series (2 x 3) to optimize the torque and power to the regulator. The latter’s unconventional 39° inclined balance at 6 o’clock maximizes timekeeping precision by minimizing the effects of positional variations. Of course, the T-1000’s incredible fuel storage capacity must be complemented by an equally impressive power generation system. And what a system it is. The oversized winding lever allows around 10 times as much winding force to be applied than a normal winding mechanism. Discreetly contained within the case, it not only endows the T-1000 with a robust and virile identity but also provides a uniquekinaesthetic pleasure for the owner, for whom the phrase “filling up the tank” will take on a whole new meaning. The body of the T-1000 was designed by Eric Giroud in collaboration with Rebellion. The case – developed concurrently with the movement to ensure completely harmonious integration – boasts imposing rounded sides that give hint of the complex chassis and mechanics underneath. A window in the side reveals one of the mainspring barrels, with markers providing a natural “fuel gauge” for the power reserve. Thanks to the three-dimensional, open-dial architecture, the vertical roller-borne hour and minute indications stand out in all their glory, while the balance, escapement, ratchet and gear train are also in full view. The streamlined taper from the centre towards 6 o'clock furnishes further evidence of Rebellion's car racing pedigree, a pedigree reinforced by the patented time-setting clutch activated by a push button in the crown that makes setting the time as simple – and as pleasurable – as shifting gears.